The laws are in place, but because of the lack of enforcement, illegal home renovations are widespread and left largely unchecked, while residents continue to be ignorant of the hazardous situation they have put themselves in. In the current economic climate, more and more home owners are choosing to expand their current dwelling rather than upgrade into a new home, as this represents a more economically viable option. However, concerned citizens and public servants say that this scenario amplifies the need to educate the public about proper procedures and it is high time to push for active enforcement. Renovations and extension work on landed residential properties are a common sight in urban neighbourhoods, especially among terrace houses, as occupants consistently seek new ways to expand their living space and accommodate their growing needs. Some of the most common renovation exercises include the knocking down of walls, erection of new gates or fencing, upgrading of the overall façade, and the installation of new tiles for the driveway. Another common sight is the extension of the rear of the home, usually from the kitchen area, to the boundary of the allocated property plot – and sometimes beyond it. A field check by Real Spaces found that there are a great number of renovated terrace homes in well established neighbourhoods that have not complied with existing building regulations. “Some are so far outside the acceptable perimeters that it is hard to imagine that they have complied with regulations or obtained permission from the relevant authorities to proceed with renovation works,” said one concerned resident of a well-populated Subang Jaya neighbourhood. Enforcement is urgently needed to put a stop to illegal extensions to avoid unnescessary mishaps. In some cases, the back of certain properties are extended so far out that they eat into the back lane. The existence of the back lane does not simply provide residents with added convenience, it serves as a buffer zone for emergencies – as stipulated by Uniform Building By-Laws and regulations put forth by the Malaysian Fire and Rescue Department. 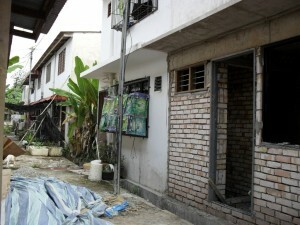 A resident from a matured township in KL who wished to be known only as Chong, 55, highlighted that some of these extensions, built over 10 years ago, are fully walled and have completely blocked out the back alley. He pointed out that by doing so, they have negligently obstructed an emergency access for the fire department. The worst of it is, by walling up the rear of their homes, they have left themselves with just a single exit point in the event of a fire, essentially making it a death trap. “It takes one resident to start the trend, and everyone else follows. Now the back alley is impassable because of such illegal extensions, creating a risk not only to the houseowner but also neighbours. The back alley is a mandatory requirement as it acts as an emergency route that serves all residents along the row, in case of a fire or any other disaster,” said Chong. Chong stressed such illegal renovations are the result of gross ignorance of the building guidelines. Highlighting a similar situation in Penang, Council Engineering Department deputy director A. Rajendran told a local daily that there are many terrace houses on the island that encroach into the back lane. Quoting the Back Lane Planning Guidelines 2012 set by the Federal Department of Town and Country Planning Peninsular Malaysia, Ministry of Urban Wellbeing, Housing and Local Government, he reinforced the fact that the back lane is legally defined as an emergency route for fire escape. Therefore, he said, owners of such renovations and extension works that do not adhere to the provisions stated in Road, Drainage and Building Act 1974 (Act 133), Laws of the Uniform Building 1984 and Town and Country Planning Act 1976 (Act 172) in the Uniform Building By-Laws 1984 could be fined or have the extensions demolished. Fire Prevention Council Malaysia national chairman and former Fire and Rescue Department director general Datuk Soh Chai Hock, who is also Institution of Fire Engineers Malaysia’s founding president, said there are laws such as the Uniform Building By-Laws and the Fire Services Act 1988 to prevent problems that might arise from unapproved renovations. Soh stressed that based on the Fire Services Act, under the Abatement of Fire Hazards section, it is stated that fire-hazard abatement notices could be issued by the Fire and Rescue Department director-general to the unit owner. He pointed out that local authorities have the power to put a stop to illegal renovations through stricter enforcement, and there are certainly enough laws in place, but pro-active enforcement is urgently needed. In agreement is the National Housebuyers Association (HBA), which added that local councils have to take their responsibilities more seriously as such transgressors should be taken to court and be fined. In fact, the association pointed out, even after illegal renovations have been demolished, the owners could still be prosecuted as an offence has been committed. HBA stressed that building owners will need a building permit even if renovations are not massive and building without a permit can result in the demolition of an illegal structure. It explained that building owners who want to add a storey or have extensions that amount to more than 50 per cent of the existing floor space are required to obtain a planning permission. Otherwise, they can be fined up to RM500,000 and ordered to demolish the extensions. Non-compliance with court-ordered demolition could incur a fine of RM1,000 on a daily basis. Meanwhile, KL City Hall’s Urban Design and Building Department spokesperson has urged residents of neighbourhoods with such illegal renovations to immediately make a report to the local authority or their residents’ association. This will help speed up the fine or court order process to compel the owner to demolish any illegal extensions on the property.